Every tool you use serves a certain purpose. Before launching an Academy, you definitely want to achieve certain results - for example, reduce learner churn. Learner churn, in simple words, is a number of learners who leave your Academy in a certain period of time. In Academy, content is your main tool to establish relationships between you and your learners. That’s why reader’s activity is the important indicator of a successful content strategy. At some point, you will find out that not all of your learners pass your courses. Some of them will not continue studying after their first visit. Others will read part of your lessons and never complete them all. And a couple people are mainly clicking the “Next Lesson” button to rush to the end of the course. It’s to be expected that some people will not read a course (or courses) until the last word. You have a reason to be concerned when a large part of your learners quit education at the same point. But it is important to clearly define your goals before changing content. You want to explain to your learners how to use your product in the best way and create an “instruction”. You decide not to make a direct instruction and move on to writing valuable content on a closely linked topic to engage more readers. You create a course about, for instance, launching a newsletter or using SEO methods for your website. In each case, you want to get different results. In the first case, you want to ensure maximum understanding. It becomes a key goal of reading your content. Second one is achieved better with a nice call-to-action at the end of education: you can offer promo codes or redirect learners to a demo page. Adding more value to education and receiving certificates is a completely different task type. Some companies even create a separate page for certified learners - their Hall of Fame. All learners with extraordinary achievements get there, and it creates competitive element. Competitive element in your courses means that your learners have to work hard to complete a course. It will have a strong effect on your content. Still being clear, your texts should be “authoritative”: contain technical terms, describe complex services and review important tools. This is not the “basic” course, it is “advanced”. Quizzes, consequently, should have a corresponding difficulty level: hard content equals hard quizzes. But these difficult courses are not for everyone. Some of your learners probably will not pass them, and the more valuable will be the award. Of course, you can find the number of passed lessons and courses on each learner in his profile. But when you have a lot of readers, it takes too long. With no quizzes, it is nearly impossible to receive direct feedback from learners within your Academy. The only indirect evidence you can use is the amount of time they were active in the Academy. Those learners who spend more time and complete lessons can provide you with fairly accurate statistics. Thanks to them, you will learn about the main points where your learners drop out from your course. We created funnels in your Statistics section specifically to save your time and provide you with an overall picture. Funnels are a convenient tool for identifying overall trends in your learners’ behavior. You will see what and in which lessons and courses your learners prefer reading. Also, you will clearly see where your learners abandon education and close your Academy. This is one of many important advantages of Academies over some other types of educative content. Your content is hard to read. Size isn’t the only thing that affects readability. Plenty of unnecessary synonyms and lack of paragraphs make life difficult too. Text too long. Large lessons are hard to read and even harder to focus on. Mixed difficulty level. Adding both complex technical terms and tips for newbies will make your text uninteresting for all of your auditory segments. The complexity of the text. When the text is full of technical information, some learners may find it overwhelming. Very difficult quiz. Coupled with complex text, it will definitely cause learners’ churn. 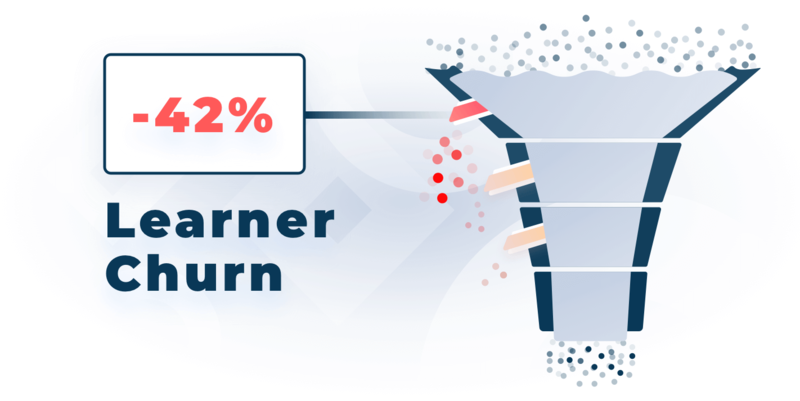 The statistics section will provide you with detailed data on learner churn. 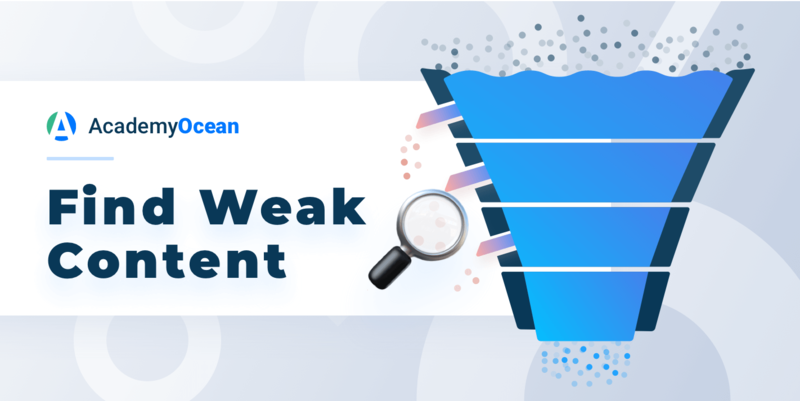 Thanks to funnels, you will easily find out all the weak spots in your content and fix it. This tool is the great advantage of your Academy over other content forms. Your content creation and editing strategy will differ depending on your goals. If you want to make education in your Academy more “exclusive”, then you should use complex texts with hard quizzes. Receiving a certificate thus becomes a small challenge. If not, you should rather switch to more simple and clear texts. This will decrease learner churn.